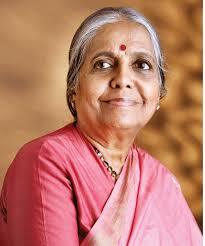 Dr Vijaya Venkat is the founder of The Health Awareness Centre (THAC). THAC was started in 1989, to create a link between our daily habits and its effects on the environment. Through its activities, the center contributes in the spheres of Food, Health, Ecology & Employment to the community at large. THAC provides Personal Counselling, Nutrition Re-education Classes, Workshops, Study groups, Open House, Library and Documentation, Training and making available wholesome, real (and organic) Foods & produce, through a Lunch Service and Catering Orders. Dr. Vijaya Venkat is an honors graduate in Chemistry from the University of Bombay, with a postgraduate diploma in Dietetics and Applied Nutrition. The college of Life Science, Texas, USA, conferred on Ms Venkat the degree of Doctor of Philosophy in Nutritional Science, after she completed a prescribed course in 1991. Dr.Venkat is also a professional member of The American Society of Nutritional and Dietary Consultants. A paper on ‘Recommended Dietary Allowance And Its Recuperation On Humanity’ she presented at the conference on Alternative Approaches to Medicine, at Copenhagen,(Denmark), and the discussion it generated, has been regarded as one of the two important highlights of the event. For her contribution to health science, the Medicina Alternativa International, Denmark 1987, awarded Dr Venkat a Doctor of Philosophy degree. In 1994 she was awarded the BEST Medical International Award (USA) “in recognition of 20 years of dedicated service in the field of diet and nutrition, for better health without medicine.” Rotary Club of Bombay (South) honoured her work with a “Vocational Excellence” award in 2007. The World Wellness Open University conferred on her the “Wellness Service Award to Humanity” in the areas of wellness and wellbeing in 2008. More recently, the Rotary awarded her with ICON FAMILY AWARD and Divine Noni awarded her Wellness Star Wellness Mother award. She is the intellectual backup for the World Wellness Movement which is taking route through Divine Noni Biotech. She along with the THAC team has formulated a course for natural living which is accepted at Indira Gandhi Open University. Dr. Venkat has consciously chosen to divert her attention to Natural Living and Natural Farming in India. Over the last three decades she has been involved with people and organizations that help to restore the balance between Development and Health. She was one of the activists to influence and prevent ODA funding for the Narmada River Valley Project from Japan Prakruti, now 25years was one of the earliest registered organization in Mumbai to actively promote environmentally sustainable lifestyles. Under her direction as Vice President, Prakruti became a platform for bringing together activists and consumers. She was one of the chief initiators of the first conference in Natural Living and Natural Farming at Bordi, Maharashtra. The one and only time natural living was included as part of sustainable development. Her personal interactions with the grand masters – M. Fukouka, Bhaskar Save, Sunderlal Bahuguna, Baba Amte, Bill Mollison, and Winnin Pereira along with many spiritual masters enabled her to share the connections and similarities between our Body and the Earth giving birth to THAC in 1989. Through this ‘Self Care Health Care Earth Care’ (SHE) was born. Today through her natural farm and Streekheti, at Vangani village (Maharashtra) she is able to directly practice & share these ideals. 3 villages in Maharashtra were brought under her wing to revitalize, train and motivate Angan Wadi workers to redesign and provide wholesome, nutritious food to 400 children for the midday meal program. Not only did more children start attending, but the active role of the Angan Wadi women ensured that infant mortality and nutritional health dramatically improved. She is also a founder member of a community project at Wara, Vanwadi. As a practicing nutritionist for over three decades, Vijaya has been educating people to understand how our body functions, empowering them to break away from conditioned and fragmented dietary habits by guiding them to adopt eco-healthy lifestyles. Instead of depending on the present system of Medicure, based solely on short-term cures, she aims to shift the focus from illness to wellness. Her emphasis is on putting Health Care back into the hands of individuals, through awareness of Health Management principles, which is Self Care. A trust- TRUTH (Trust for Re-education & Understanding of True Health) has been established, to focus on research, documentation, training & awareness in the fields of Health Care & Earth Care.Vangani village, is where presently, the goals of the Trust are implemented. As a pioneer in the field of natural health and ecology, for the last 3 decades, Dr.Venkat has presented papers in conferences, on Natural Hygiene/ Organic Farming, all over the world. She conducts Health Awareness workshops throughout India and abroad. Her challenge is to integrate the theory and practice of Natural Laws, not as an “alternative” but as a whole Way of Living. Her approach is based on the principle of “Wellness is Oneness”. She seeks to provide a simple reminder to live in harmony with Nature through participative caring and action. Her work includes writing on health issues in mainstream publications and making freely available the information that supports true learning and healing. Dr Venkat often initiates dialogues on Food Safety, on pertinent issues such as irradiation, immunization, iodization or GM Foods- issues that affect our Safety and Food Security. She believes that by taking measures to protect the Earth we will also protect our Body. She continues to be actively involved in the daily working of the Centre.